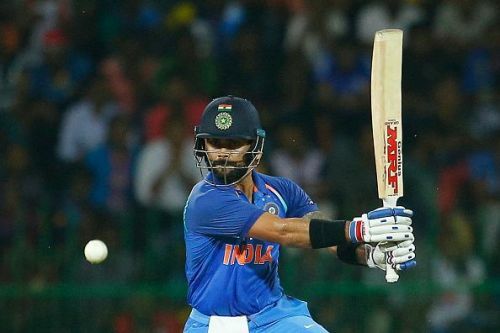 Virat Kohli became the fastest ever to reach the milestone of 10,000 ODI runs, adding another feather to his bulging cap of records in international cricket. The 29-year-old achieved the feat during the second ODI between India and West Indies at Visakhapatnam, the same opposition against whom he had gone past the 5000 ODI runs back in 2013. He became the fifth Indian after Sachin Tendulkar, Sourav Ganguly, Rahul Dravid and MS Dhoni to complete 10,000 ODI runs, getting to the mark in his 213th game. Overall, he is the 13th batsman to join the list. Having made his debut in August 2008, Kohli also became the quickest to get to his the mark duration wise, surpassing Rahul Dravid, who got it in 10 years and 317 days. He took the least number of innings to reach the landmark, taking just 205 innings to achieve the feat. He bettered Sachin Tendulkar's record by more than 50 innings - Tendulkar had taken 259 innings when he reached the mark, against Australia, in 2001, in the process becoming the first batsman ever to reach the milestone. The last batsman to break into the 10,000-club was Mahendra Singh Dhoni, Kohli's captaincy predecessor in the Indian team. Dhoni reached the landmark during the England tour earlier this year, joining the club in July at Lord's. The game also saw him breaking several other records - becoming India's highest run-getter against the West Indies in ODIs. He went past Sachin Tendulkar's tally of 1573 runs. He also went past England's Joe Root to become the second highest run-getter in ODIs in 2018. Only Jonny Bairstow is ahead of Kohli on the list, with 1250 runs. Kohli also got his fifth 50-plus score at Visakhapatnam, joining Zimbabwe's Brendan Taylor in the list of most 50-plus scores in ODIs at a venue. Mohammad Yousuf leads the list with seven 50s at a venue (in Karachi). For the complete list of highest ODI run-getters, click here. To check the list of all the milestones from Kohli's knock, click here.